… Ever since the velvet trend came back in style I have been obsessing over it, so I wanted to show you how you can take this trend into the colder seasons, and style this beautiful velvet jacket from Soft Surroundings for Winter. I wore this look few weeks ago, and got so many compliments on this jacket. Unlike other velvet items I own this jacket is the softest and most luxurious I have seen so far. My favorite thing about the jacket are the metal buttons which gives it that chic military look. So, how does one style this trend for winter? Here are three items you need to rock this trend this season. 1. Add a chunky knit sweater; it will keep you warm and add some texture to the smooth and silky look of velvet. Don’t forget to SHOP this post in the carousel below! Velvet is my current fave! Great look! I love this entire outfit! Nice girl ! LOVE this jacket girl! This look is so festive!! Ahhhh print mixing is my jam. 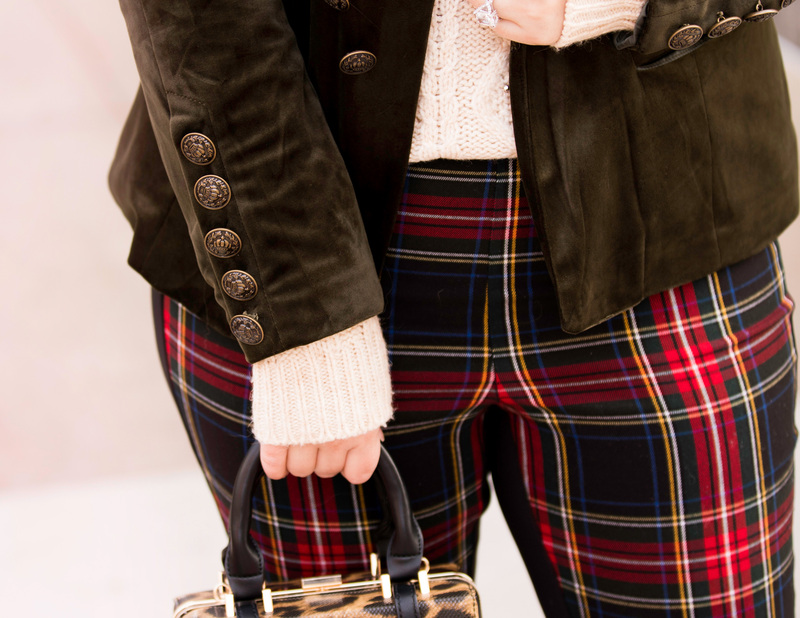 Love those plaid pants with the leopard bag. Merry Christmas!